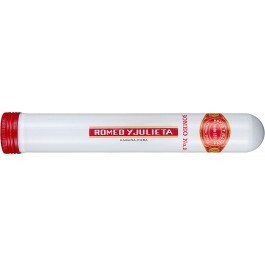 The Romeo y Julieta No.2 is a smooth medium-bodied Petit Corona, 5.1” (129mm) long, of 42 ring gauge, and comes in aluminum tubes in a 25 cigars box. It similar to the Petit Coronas from the same brand, and full of flavors. It has obviously some familiarity with the other Marevas from Romeo y Julieta. It reveals some earthy, woody aromas, and also a good amount of leather and some hints of spice on the tongue. The construction is wonderful, it is a beautiful hand rolled stogie, and the packaging, the magnificent aluminum tube, makes it a cigar that every cigar enthusiast should have in his humidor.